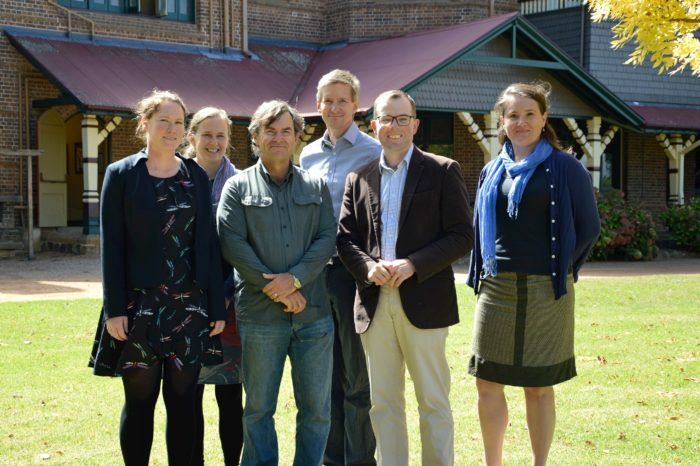 Northern Tablelands MP Adam Marshall pictured at University of New England announcing the State Government funding for two ecosystem management projects with Dr Debbie Bower, Dr Rose Andrew, Dr John Hunter, Dr Tim Paine and Dr Manu Saunders. NORTHERN Tablelands MP Adam Marshall today announced a $699,951 conservation grant from the State Government for two University of New England (UNE) studies which will work towards stabilising and restoring threatened woodlands and wetlands in the region. Mr Marshall said the funding was the result of an application made last year by UNE Ecosystem Rehabilitation lecturers, Dr Tim Paine and Dr Debbie Bower, to the NSW Environmental Trust program, Saving our Species. “The revegetation program will focus on managing the viability and genetic integrity of threatened woodlands and forests in the New England region,” Mr Marshall said. “One of the important steps in the project will be to establish a genetically-screened seed orchard from the key two Threatened Ecological Communities (TECS) – New England Peppermint Woodland and Ribbon Gum-Mountain Gum Snow Gum Woodland. “The project team will also evaluate the population growth rates in the region and how that impacts the woodlands. They will also look at low-cost methods to promote seedling recruitment and ways that balance TEC restoration with the economic needs of land holders. Mr Marshall said the second project, Dynamic Lagoons, managed by Dr Bower, would survey and monitor the ecological function of threatened Upland Wetlands on the Northern Tablelands to build knowledge of the many benefits the unique wetlands provide. “A key part of the project will be establishing an evidence-based public engagement and education program to raise awareness of the importance of the wetlands,” Mr Marshall said. “Long term commitment to wetland conservation will be established through conservation agreements with community stakeholders such as landholders, councils and schools. “The project will build on a baseline survey conducted across the Northern Tablelands in 2017-18 of 28 private and public lagoons. Mr Marshall said the ecological effects of different land uses would be investigated alongside experimental restoration techniques such as fencing and livestock reduction. “These are very exciting projects and I’m delighted the State Government is financially supporting UNE in this important work,” Mr Marshall said.